Free Shipping Included! HIOTECH iPad Pro 12.9 Keyboard Slim Aluminum Wireless Keypad with 7-color LED Backlit & Built-in 5600mAh Power Bank for iPad Pro 12.9 (gold) by HIOTECH at Pacs BG. Hurry! Limited time offer. Offer valid only while supplies last. HIOTECH iPad Pro 12.9 Bluetooth Keyboard Case With 7-Color Backlit & Aluminum Alloy Shell, Free To Get A iPad Tempered Glass Screen Protector! 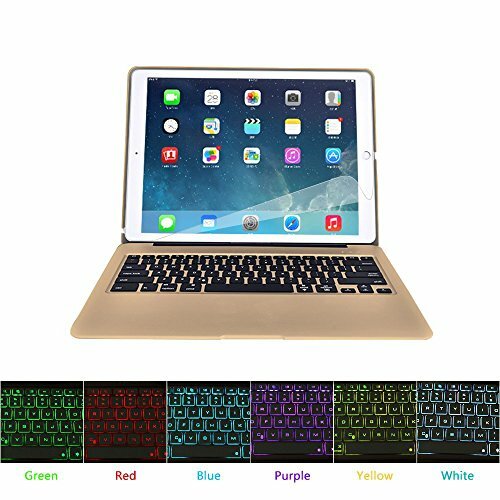 HIOTECH iPad Pro 12.9 Bluetooth Keyboard Case With 7-Color Backlit & Aluminum Alloy Shell, Free To Get A iPad Tempered Glass Screen Protector! Aluminum alloy looks luxury and durable. The full-body aluminum coverage to help protect your iPad wherever you go. Backlighting design, can provide different brightness control, provide diffrent visual enjoyment for you. With 2800mAh capacity power bank, can charge for your mobile phones, tablets and other devices, include iPad include iPad Pro 12.9.
iPad Pro 12.9 keyboard protective clamshell case only design for iPad Pro 12.9. Not for iPad Pro 9.7. SEVEN COLORS BACKLIT KEYS: The fantastic LED backlit keys that provide the perfect typing experience for you and will help you work in the dark. You could swith 7 colors freely, and provide you a different visual enjoyment. BUILT-IN EMERGENCY POWER: With 2800mAh capacity power bank, it is not only a keyboard for work, but also a power bank for your iPad or Phone, can chager for your mobile phones, tablets and other devices, include iPad Pro 12.9. ALUMINUM ALLOY CLAMSHELL CASE: The full-body aluminum coverage to help protect your iPad wherever you go. With its durable and abrasive resistance case, it protects your iPad from scratches, dust, and more to keep it looking great. COMFORTABLE & SPECIAL FUNCTION KEYS: Optimized keys design help you get more done from the convenience of your iPad Pro 12.9 keyboard. HIOTECH WARRANTY: If You're Not Completely Satisfied with Your Purchase Simply Let us Know and You'll be Offered 180-Day FULL Refund or Replacement, No Questions Asked. Enjoy this Absolutely RISK FREE and Lifetime Limited Product Warranty. Purchase Today by Clicking the Yellow "ADD TO CART BUTTON" Above.